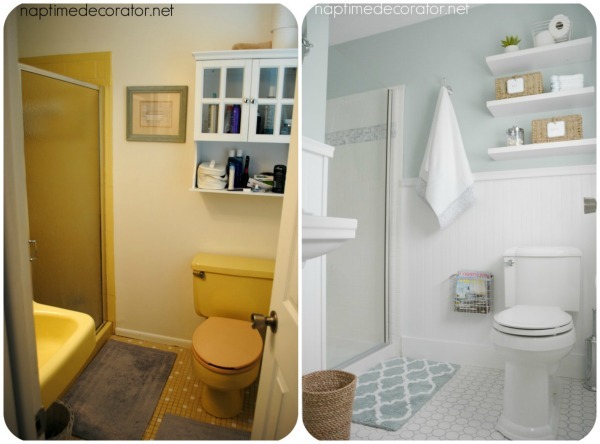 Goodbye 1965, Hello 2014: The Master Bath Makeover! I apologize for the excessive caps, bold, italics, and exclamation points in advance. It’s gonna be one of those kinds of posts. Because you see, THE MASTER BATHROOM RENO IS DOOOONNNNEEEEE!!! I’m not screaming at you, I promise. I’m just SO STINKING EXCITED about it. (See what I mean about the caps? I can’t help it). This is going to be a picture overload post and let’s just get down to business, shall we? Being the parents of three babies and toddlers (total, not each. WOW), we didn’t have the time or money to gut this bad boy, no matter how badly it needed it. Then FINALLY. 8 years after we moved in, we decided it was time. I did a happy dance like you’ve never seen before, when I heard those beautiful words come out of my husband’s mouth. We called ‘our guys’ – same ones who’ve been with us from the beginning, who finished our basement years ago, who we call every time there’s something we need help with (we know our limits!). We picked everything out, and they did the work. Well, everything but painting and hanging some of the stuff. I painted and the hubs hung the accessories. Team effort! They are awesome – it’s like old friends hanging out in our house when they get here! Let the picture overload COMMENCE! 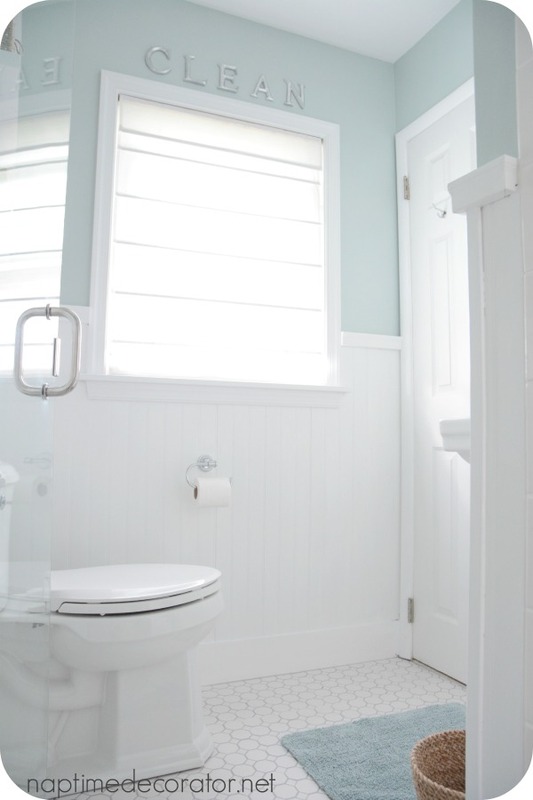 We went with Sherwin Williams Rainwashed on the walls, and white beadboard on the bottom. Per our contractor’s suggestion, we chose vinyl beadboard instead of wood, so it won’t warp with the humidity. Looks exactly the same, and we’d never of thought of that! 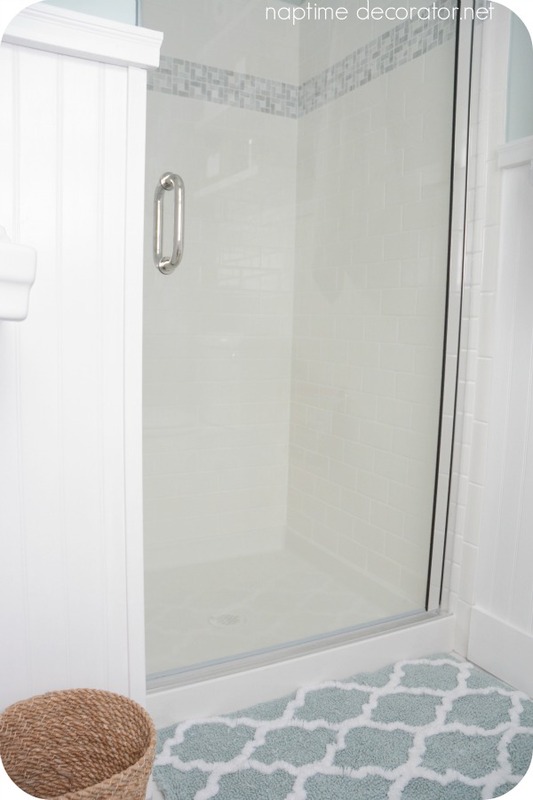 We like the looks of frameless glass shower doors, so I ordered that (should’ve done that first – it took a couple weeks to be delivered, and we could’ve been done earlier). Oh well, you live and you learn. For the shower floor, it was SO much easier (and therefore cheaper), to go with one of those already sized out white floors that just plop into place. Ok, I’m sure there’s more to it than that, but you get the idea. I was cool with it. For the floor outside of the shower, we chose an octagon mosaic tile from Lowe’s, and went with a medium grey grout. And can we just talk about this toilet for a second!? I never thought I’d fall in love with a toilet. A TOILET. But look how purdy! It’s the Devonshire model by Kohler. I loved the lines. Seriously. I LOVE THIS TOILET. And that magazine rack there next to it was a black metal basket I found at Hobby Lobby. I scored it for 50% off and spray painted it with Valspar Metallic Silver. We didn’t want to drill into the beadboard (you KNOW how much I change my mind and we’d be left with two big holes in the beadboard! ), so we used some 3M hooks that won’t mess up the wall if when I change my mind. 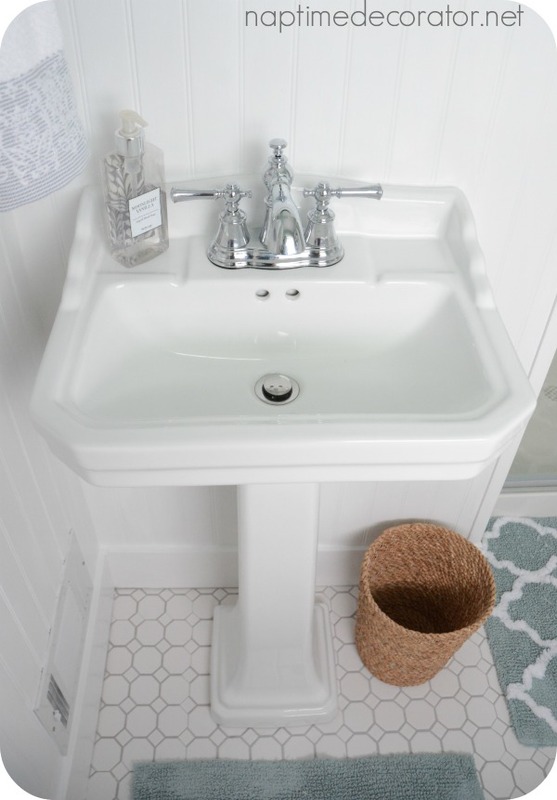 And this cute little pedestal sink is from Home Depot – I love it! It’s small, but our bathroom is teeny tiny anyway, and I like that the edges aren’t sharp, since you have to walk by it to get in the shower. You might be wondering where we keep all our stuff? There isn’t even a toothbrush to be found?! Wellll, that was a huge conundrum. 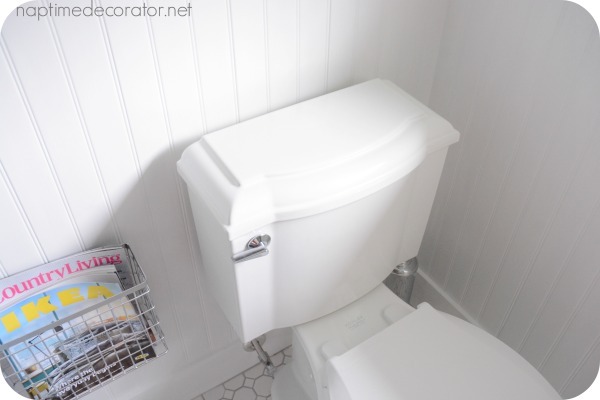 I found SUCH a pretty medicine cabinet online, to hang over the toilet with tons of storage. It got delivered, and ended up looking monstrous. I mean. There was no way it was going to work in this tiny room. My husband suggested floating shelves. He thought it would be fun to do something different than we had before, and I agreed. But I have to admit, the storage issue scared me a little. In the end, I figured, what the heck, and we went for it. And you know what? It’s made us downsize and keep in there only the stuff we use everyday. I’m not a huge makeup girl anyway, so I just have my basics, along with deoderant, toothbrush, toothpaste (yes, my sensitive teeth require a different toothpaste than Mr. ND;), and that’s about it. 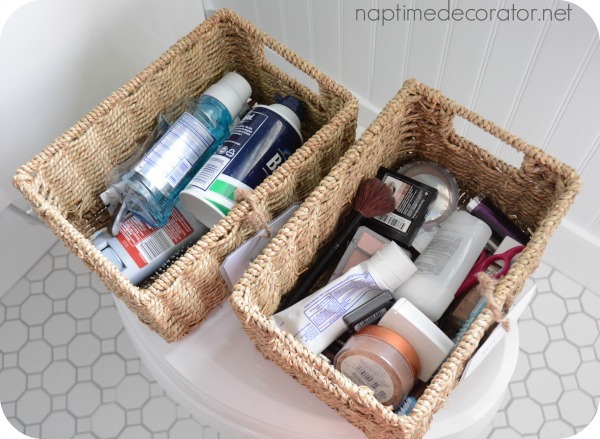 We bought floating shelves and baskets – both from Lowes – and we each have our own basket for our stuff. It’s really working out just fine! Wondering where the hair dryer is? I had never used this bathroom for that before, since we didn’t have an outlet before this reno. The main hallway bathroom is much bigger, and has more counter space, so I always used that one to do my hair. So on the odd days I actually DO blow dry my hair (let’s be perfectly honest, it’s about once or twice a week), I continue to use the hall bathroom. 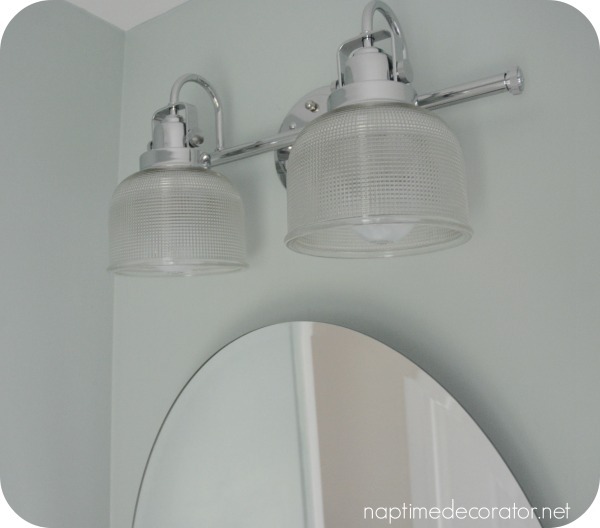 For the light fixture, I gravitated towards this kinda industrial looking chrome one I found online at Lowe’s. 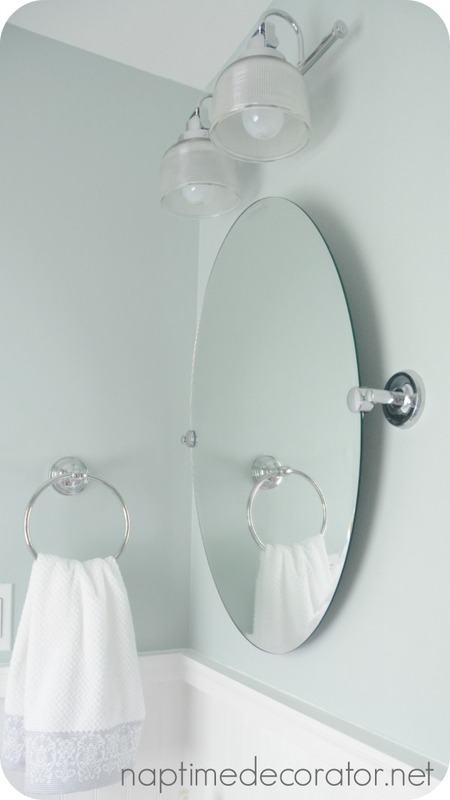 And that mirror and chrome towel ring is another Lowe’s purchase as well. I love turning the water off, opening the glass door, and seeing this view. 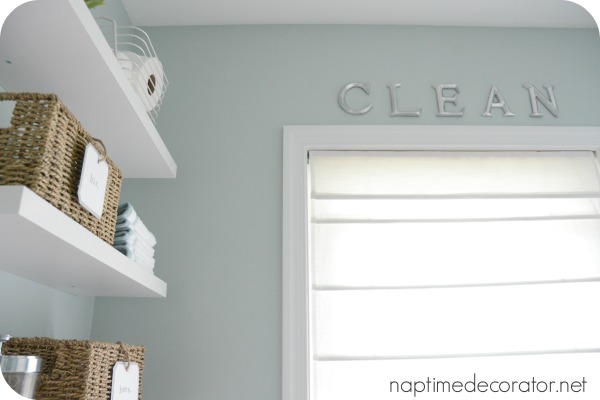 I purchased the white textured roman shades from Lowes, and the CLEAN letters were black ones from Hobby Lobby that I also snagged for 50% off and painted with the silver spray paint. Just thought it’d be a fun touch. 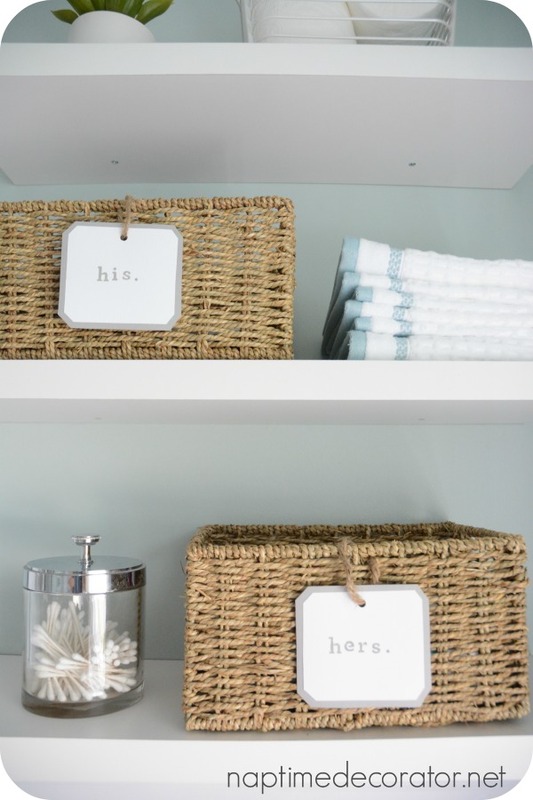 (Towels, washcloths, and plant on top shelf all from HomeGoods, chrome toilet brush, white basket from Marshalls, and I already had that glass and chrome jar with the cotton swabs). Well I think that about wraps it up! I swear, it feels like it’s 4 feet bigger in here to me! What do you think? If you have a question or inquiry about anything I forgot to include, please drop me a comment and I’ll get back to you! Beautiful!! I have a rough in for our 3rd bathroom in our lower level. I can not wait to finish it off!! Jealous to say the least!! Thank you, Laura! Good luck with the 3rd bath! Great minds think alike;) Thank you, Megan! I.love.your.bathroom!!! 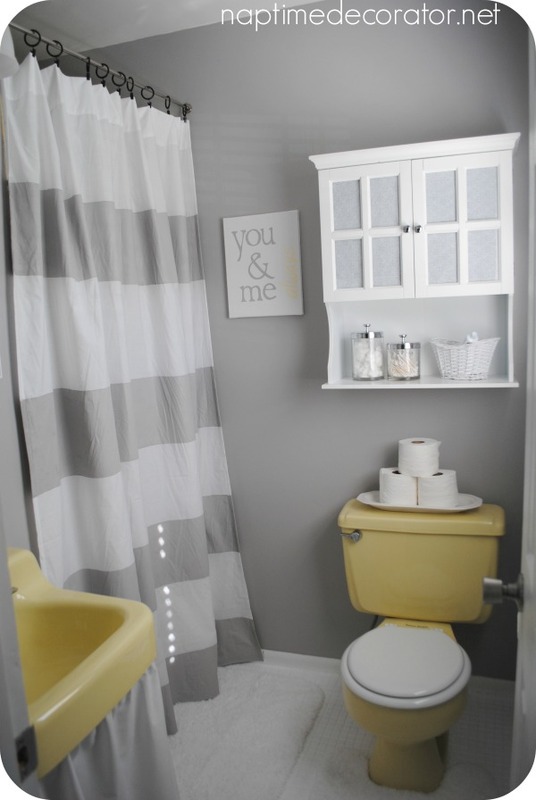 We are about a year away from remodeling our master bath which is also small so I’m sure I’ll be copying you! What’s the old saying “imitation is the best form of flattery”! Thank you as always! Just beautiful! It’s always so thrilling to have a new space and to get rid of something that just wasn’t working for you before. Although, I do have to say that your $70 fix was pretty genius as well. Where did you find the floor for your shower? 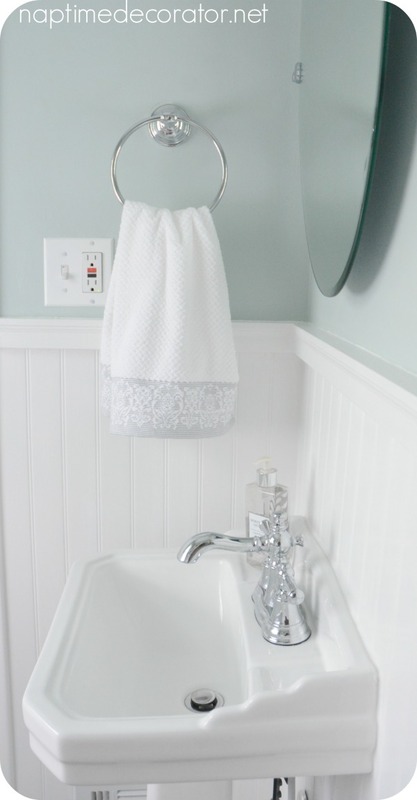 We need to redo ours (it is the standard plastic shower) and my husband and I love the looks of yours! Thank you, Stephanie! Our contractor got it for us – I do know I removed a sticker that said “the Edge” on it, if that helps! Where did you order your frameless shower doors from? we ordered it through Lowe’s. It’s gorgeous, Liz! I’m so happy for you. And it really does look a lot bigger!! Thank you, Kimberly! Glad you like it! AWESOMENESS!!!!! I love every single detail, what an incredible reno!!! 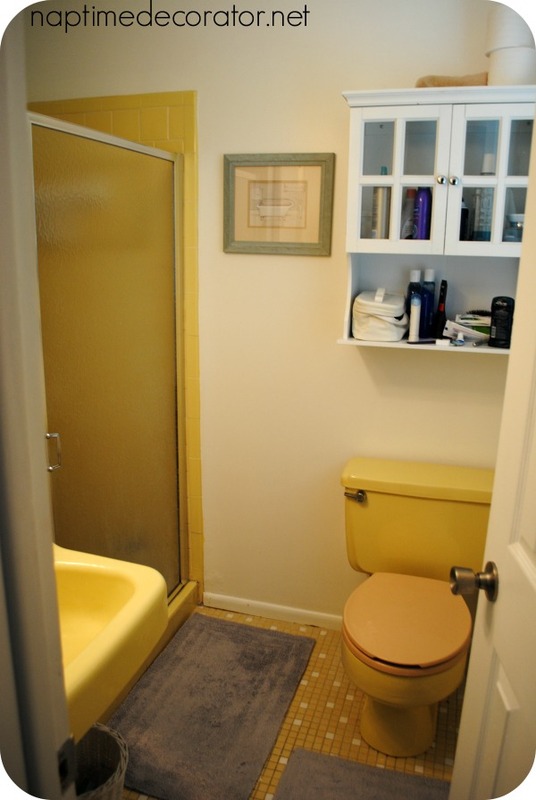 Your bathroom is so lovely and serene. Well done! Wow great job! I really like the colors and tile in the shower! Fabulous!!! We have a “quaint” pink main bathroom . Okay – where in world do you get vinyl beadboarding? I have searched and searched with ZERO luck. What am I doing wrong?!!! Happy for you – maybe one day our pink will magically turn to white !!! Thank you! Got it at Lowe’s! The most amazing makeover I’ve seen on this site….I love EVERYTHING about it. New bathtub or did you have the yellow painted? AN AWESOME RENOVATION! Very classic and clean. Great job! I LOVE your new bathroom! What a great job you did! Can I ask where you got the rug in front of the shower? 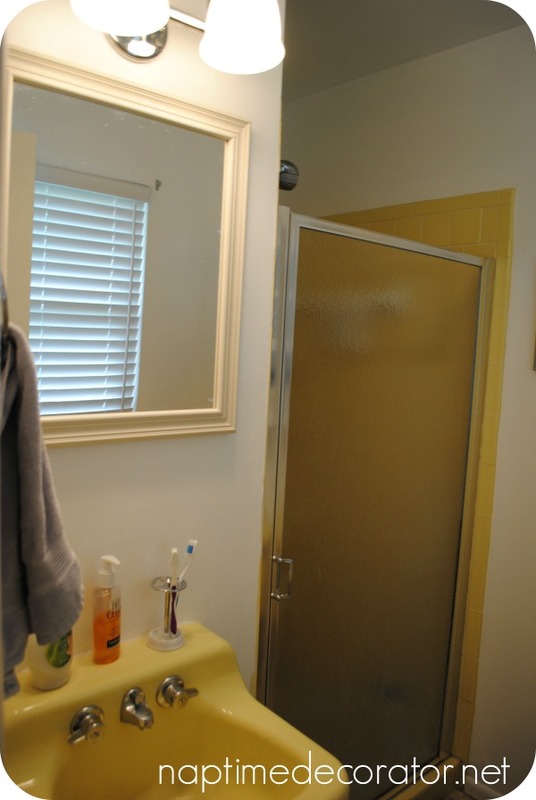 Liz, everything about your bathroom looks perfect!! I can’t believe the change, and you did a great job hiding the yellow before too :). 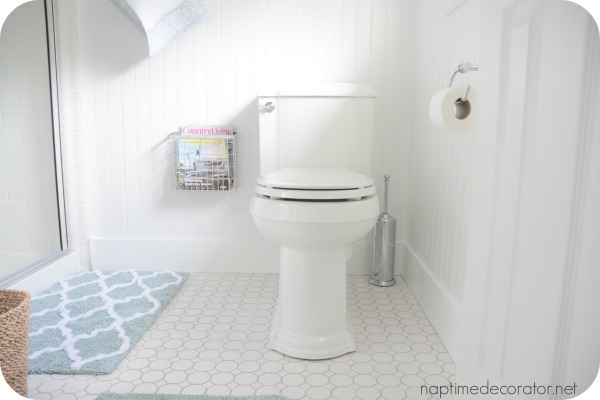 We used that same floor tile in a recent bathroom reno too. It looks great in yours! Rainwashed is one of my favorite colors, and I’d love to feature this on my paint color blog, Involving Color. Let me know if you’re interested! Sure, Jena! Share away:) Thanks so much! I remember thinking the $70 was unbelievable (I share it with everyone), but this is just amazing now that you were able to do it! Such a different feel; it must be wonderful to walk in there every day. I’m a long time reader, 1st time commenter! YOU did a stellar job!! I’m in love with all of it. I’ve been looking for a new color to paint the bedroom and I’m going to buy some of the Sherwin Williams rainwashed and try it on one wall. I think it’s the color I’ve been searching for. Thanks, Melissa! It’s a great color, hope you love it too! Gorgeous!!! 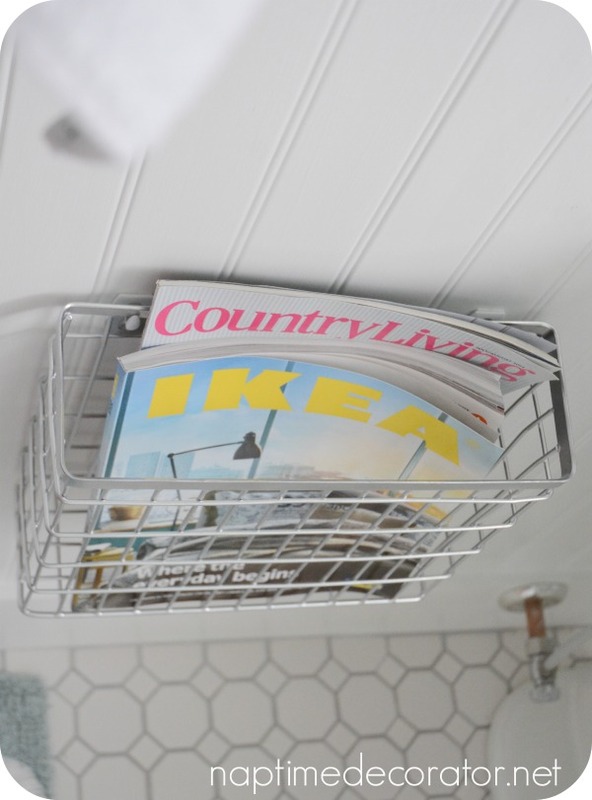 I’ve been looking for a basket for magazines – I’ll have to check HL. Thanks for all the sources! Love the new look! Is that a right-hight toilet? Your Reno is lovely! Would you care to answer a question about total cost? We have a pink version that needs attention. What you’ve done is perfect! It’s amazing! I’m copying so many of your ideas!!!!!! Great job! Hi I really like your remodel. I am working on a remodel of a 40’s bath. Unfortunately, we had to stick with the blue and black tile on the countertop but we did get to redo the floor. We used the same floor tile that you did. 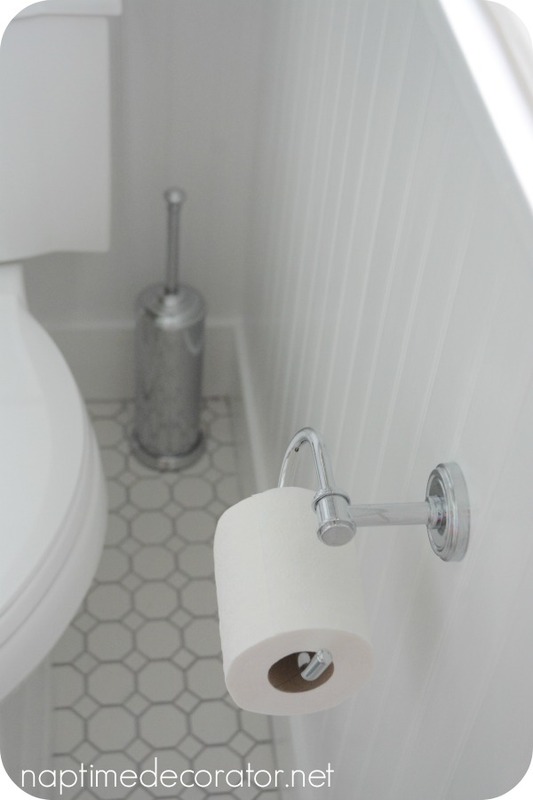 My question is, what brand and color did you use for the white walls and white breadboard ? Whites are so hard! Thanks! Hi. Thanks. There are just about 75 versions of “white”. (Simply white, ultra pure white, white linen, white cloud… The list goes on! ). I never knew white was so complicated! So yours was just “white”…, well, good choice! It looks great! Love it! I am copying your entire bathroom! Thanks! I had a light green bathroom . I can’t wait until my bathroom is completed! I love it so much! 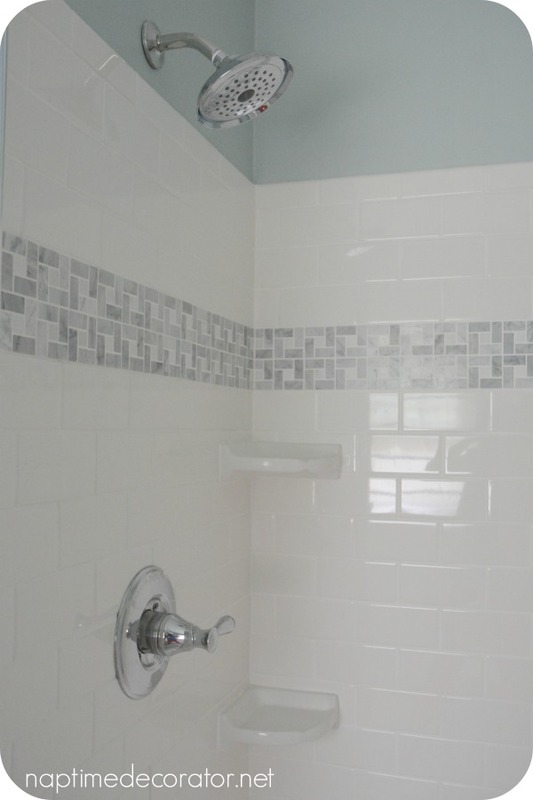 Do you have a link or any info on the mosaic tile accent strip you used in your shower? I am looking for something exactly like that! Thank you! It’s a marble tile sheet from Lowe’s that we cut – I think the sheets were 12×12 and we (our guys) cut them into strips. how wide are the strips? Love your bathroom! 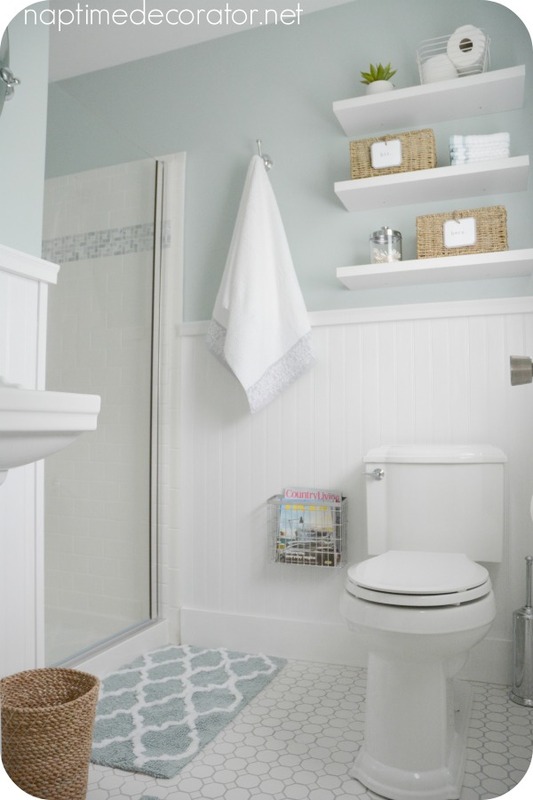 Can you share what subway tile you used? How did you get the subway to line up with the marble? Thank you! We just picked out the plainest, cheapest subway tile there was at Lowe’s, and our contractors did all the work! 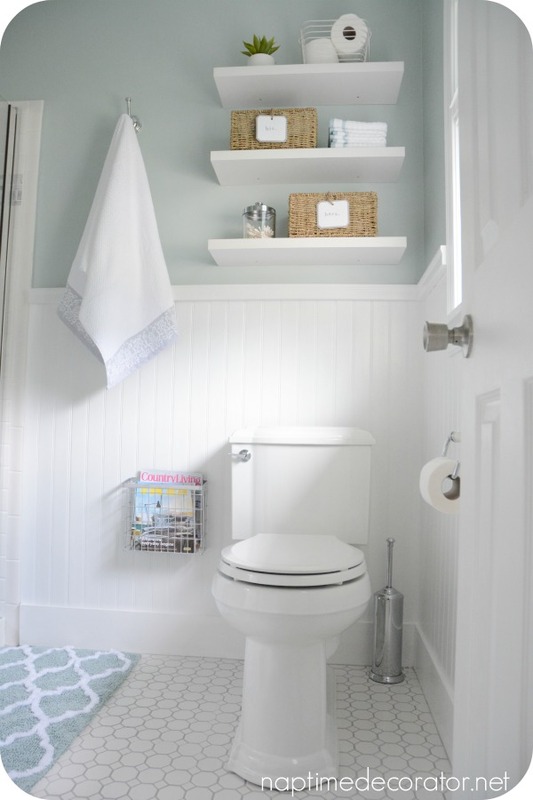 Love the mosaic stripe and subway tile….I’m doing same in my master bath/shower. Could you give me any info on your frameless shower door (source, installation)? We hired a contractor to do our bathroom & he installed a partial glass panel, assuring us that water wouldn’t leak out onto the floor. Of course our intuition was correct; it does not block water! The contractor won’t call us back, so we are going to try to install a full door ourselves. Any help you can give would be greatly appreciated! Hi Elizabeth! I’m sorry, but it was a couple years ago and I don’t have that info saved anywhere! Only thing I can tell you is I went to Lowes with the measurements my contractor told me and ordered it there. Good luck! Our contractor installed it, so I can’t offer any tips unfortunately:( It looks like regular beadboard to me! The paint went on fine. Love your bathroom. 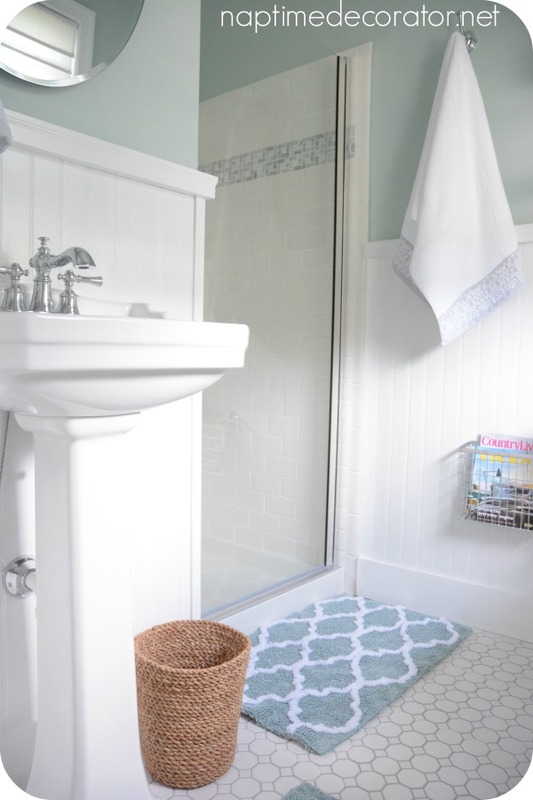 Where did you buy the subway tile and what grout color did you use for subway tile? Thank you! Lowes, and it was just white grout. That’s so pretty and peaceful ! White tiles are timeless. Love the bead board too! Nice! Love it. Do you know the tile that you used for the shower? The gray mosaic ones? Also could you give me the name of the mirror and doors? Beautiful job. Was the SW rainwashed at a certain percent? 75% I’m debating using it, but afraid it will be too dark. I only have one small window in my bedroom. Thank you!! No, it was 100%, but with just one window, you might want to try 75% – maybe pick up a sample and try it before you buy the whole gallon:) Good luck! Your bathroom looks amazing! I am wondering how your tile guy made up for the difference in thickness between your subway tile and marble accent tile? Please email me at remarkablehome at gmail. Thanks!! Thank you! I have no idea how they did it, sorry! I love your ideas on floating shelves! I’m not very creative, so this really helped me. Thank you. Happy to have found your website. I love your bathroom. Did you use Rainwashed at full strength or just a percent? I’m trying to decide if it’s too dark for laundry room but your color looks perfect. Thank you so much, Judy! Good luck! I love your bathroom. I’m in the middle of a remodel right now, and am having second thoughts about the tile I picked out. Where did you get your tile, and what colour is the grout in the shower? Do you remember what the style of the glass door is at Lowe’s? We were thinking about having it custom made. I love your bathroom so much. I chose white vanities with gray marble tops. Do you think the paint colour would look mice. Our bathroom is small and doesn’t have a window so I’m thinking it may be too dark. Love the makeover. I have looked everywhere for a similar gray marble accent in the shower and can’t find it. Any leads? I know this was a few years back, but do you have the name of the tile?